Flight 93 Photo Fraud: CNHI & affiliates - "Flight 93 crash photo target of conspiracy theorists"
CNHI & affiliates - "Flight 93 crash photo target of conspiracy theorists"
If a picture’s worth a thousand words, Val McClatchey’s is the Da Vinci Code. Her surreal photograph of a mushroom cloud of gray smoke rising above the bucolic countryside – snapped just moments after the crash of Flight 93 – has become a target for 9/11 conspiracy theorists. Five years later, the 50-year-old Indian Lake, Pa., woman is frustrated by allegations that the photo is a masterful hoax. “It’s extremely disturbing,” said McClatchey, owner of Mountain Lakes Realty near Indian Lake. Conspiracy theorists, specifically the blog Killtown, contend the photo is an elaborate fraud that starts with McClatchey and serpentines up to the highest levels of the federal government. Killtown suggests the photograph is a fake, claiming the gray smoke looks more like a plume from an ordnance blast than the black cloud from a jet crash. “If it really was an ordnance blast not too far beyond the white barn and white farm house, then this would be a true smoking gun and one of the clearest examples of complicity in the 9/11 attacks by the U.S. government because what else could have caused such a large explosion and who else would have been behind it?” Killtown wrote. McClatchey is incensed at the allegation. McClatchey says she will not respond directly on the blogs. Joanne Hanley, Flight 93 superintendent for the National Park Service, agreed. “I think what Val is going through is shameful,” Hanley said. “Just because something is on a blog doesn’t make it true. People need to realize that. On Sept. 11, 2001, McClatchey said she was watching the “Today” show when reports broke of planes hitting into the World Trade Center and Pentagon. As she was trying to call her husband from an area with spotty cellphone coverage, she said she heard the sudden surge of a jet plane and saw a silver flash outside. She said she managed to snap just one photo. “I didn’t realize any of the significance,” she said. Now, her photo has come to symbolize the crash, specifically how the war on terror began in the rolling hills of Somerset County, Pa.
An enlarged version is on display at the Smithsonian Institute in Washington, and it has appeared in U.S. News and World Report, Newsweek, Time and newspapers across the country. Through all the controversy, McClatchey said she cherishes the bonds she has forged with Flight 93 families. “They are the most wonderful people I’ve met,” she said. “I admire their strength and courage. 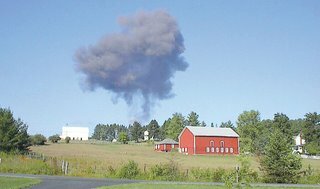 Kirk Swauger writes for The Tribune-Democrat in Johnstown, Pa.
Val McClatchey's incredible photograph, taken moments after the crash of United Flight 93 near Shanksville, Pa., has become a target for conspiracy theorists who say it is not authentic.